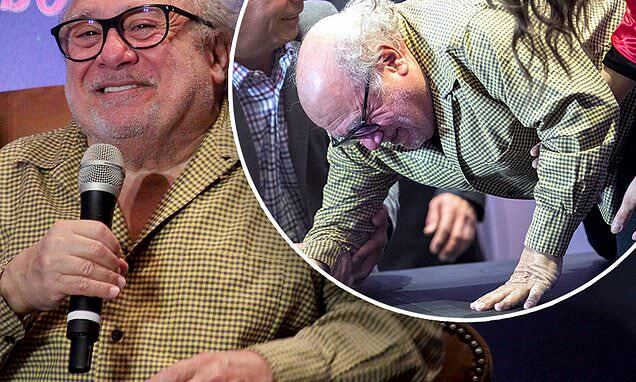 Danny DeVito took a nasty tumble as he walked onstage at a Dumbo press conference on Tuesday. The 74-year-old tripped over and went down hard at the event in Mexico City, on March 5, landing on his front on the raised platform. Putting his hands out to break his fall, the veteran actor then lay on his front, as aides rushed to help. DeVito then got back up with the help of two of the attendees, who ran to assist as he struggled back to his feet. The actor suffers from the genetic Fairbank's Disease, which affects bone growth, and is responsible for his short stature. After his initial shock, DeVito raised a smile for the assorted members of the press. Apparently uninjured, the Oscar nominee then bravely carried on with his planned press conference to promote the new version of Walt Disney's Dumbo. The Taxi actor stars as circus ringmaster Max Medici in the soon-to-be-released Tim Burton live-action remake of the 1941 classic animation.